Everyone loves this text editor. Try it out, it's free. TED Notepad is a free light-weight notepad alternative. It offers 352 text-processing functions, innovative features and timesaving tools. All of them free; all on hotkeys; all designed for quick and advanced editing. It is portable and loads instantly with no installation required. Get ready for a swiss-army-knife notepad alternative for free: small and simple, yet full of ready features, combinations, enhancements and tools. You'll never learn them all. Don't type, ted-it! Windows 10, Windows 8, Windows 7, Windows Vista, Windows XP, Windows 2008, Windows 2003, Windows 2000, etc. Current version 6.1.1. Built Dec 4, 2016. ChangeLog. FAQ. List of Notepad features. How to replace notepad on Windows? Don't type, ted-it! What does that mean? As it is, TED Notepad is particularly targeted to advanced notepad users with non-trivial demands and tasks. To discover its true power, you might need to learn a thing or two. Once you do, you won't type, "you'll just ted-it".. Interested? There is of course more than this..
Word auto-completion is based on dictionary of the current document. There is no point in creating big user-specific dictionaries and then browse through all the possible words. It's even better the other way around, because while the list of document words is usually small, TED Notepad can effectively auto-expand words to common continuation before it bothers you with dialogs and lists of all plausible suggestions. More innovative line auto-completion is based on lines of the current document. This feature offers you to auto-complete beginnings of frequent lines, including indentation, punctuation and other characters. If you are creating lists or source code, your lines often begin the same and line auto-completion can ease the usual copy-pasting practice. Try it out on source code — it's amazing how much can be auto-completed based on indentation. Copying Return is definitely the quickest way to duplicate lines, especially if you want to duplicate portions of lines. Try it on when coding CSS files — that's my favourite. Webmasters and XML coders may find useful the HTML/XML Tag generator. It helps completing < angle brackets > and closing tags quite quickly. And it never bothers you with so-much-clever wizzzards. First of all, why would you use the clipboard, when you can often do the same with Recently Deleted and Recently Inserted features? Well, if you do need to clipboard, there is plenty of enhancements..
Auto-copy to clipboard while selecting with mouse. This is a well known feature from putty. Just hold down the ctrl-key and use the mouse! And the use of the ctrl-key is optional. Of course, you can Paste with mouse as well. Again hold down the ctrl-key and right-click the mouse! The ctrl-key is again optional. The editor can auto-select current word, line, paragraph or document for you, if you try to copy to clipboard with no selection. Just turn it on in the Settings. Upon pasting, the editor can mimic case of the text being replaced. Turn it on in the Settings to see if it fits your needs. Addictive Swap clipboard feature provides a solution to moving phrases around: It niftily swaps the content of the clipboard and the actual selection. 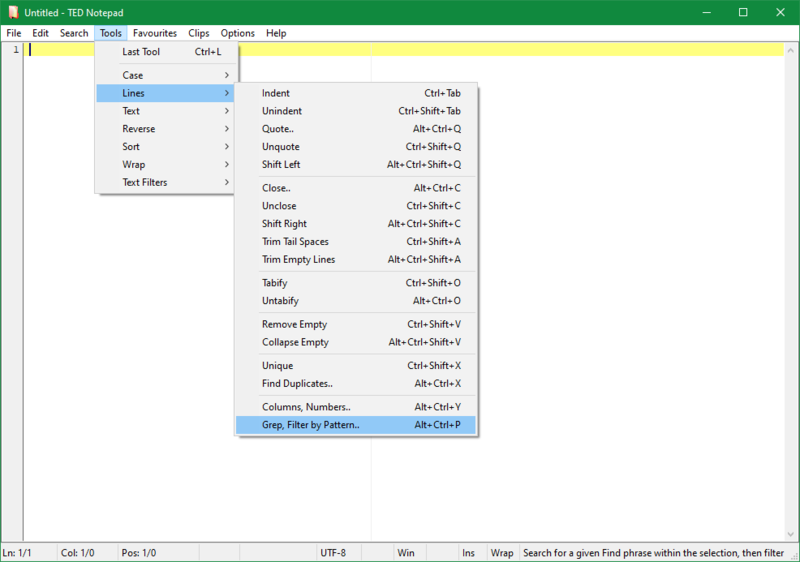 9 permanent clipboards can hold phrases you type often, saving the main system clipboard for other use. What's even better is that these phrases are being remembered even when you shut down the computer. Search is run from a nifty compact Search bar, which can optionally auto-hide after successfull matches. Though Find Selected and Find Later features offer a much quicker way to start a search. You can also choose to remember the current searches between sessions. Search over multiple lines is a must have! Fancy Select to Next feature helps you to quickly select any text up to the next occurrence of the searched phrase. Innovative Second search is also available, if you'd like to search for two things at the same time. 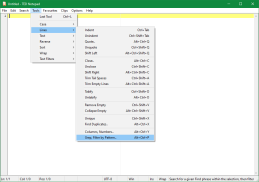 Learn how to write a Regular Expression in notepad, also called RegExp or RegEx. Use back-references in replace patterns, or employ the Search and Last Tool concept to transform the matches. With perl-like regular expressions, there seems to be no limit in what you can achieve with such combination. The Search bar is quite hotkey-stuffed. Try different combinations of Ctrl and Shift with Enter and F3 keys. Or would you rather see the documentation? Choose from variety of Text case conversions. Capitalize words, sentences or entire selection; or perhaps Random Case. Fun Case? There are 8 diferent types of text case conversions. 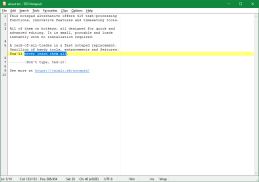 Use Indent/Quote lines tools to quote e-mails or indent source code. Use similar Close lines tool to finish every line. Use variety of Unindent/Unquote/Unclose/Shift lines tools to remove quoting or trailing characters or spaces. Try Tabify/Untabify tools, when troubled with indentation. Want to remove empty lines? Try Remove Empty Lines tool or better yet Collapse Empty Lines tool. Gets you rid fo them. Use Columns, Numbers tool to take the lines, cut portions of them and move those around, add line numbers to them, etc. Tease friends by sending them reversed emails. Reversing tools will help you out. There are 6 different types of reversing. Have a list with duplicate entries? Unique lines tool offers a good solution to remove them. Or Count the Duplicates. Ultimate Sorting tool will help you to sort by anything. Sort by specific columns within a wide comma-separated list, or just sort lines as they are. Sort alphabetically or as numbers, etc. Or would you rather Shuffle lines around? Need to repair some characters? Define the translation for Translate Characters tool. Want to replace many things at once in a very big file? Extended Replace is the quickest way. 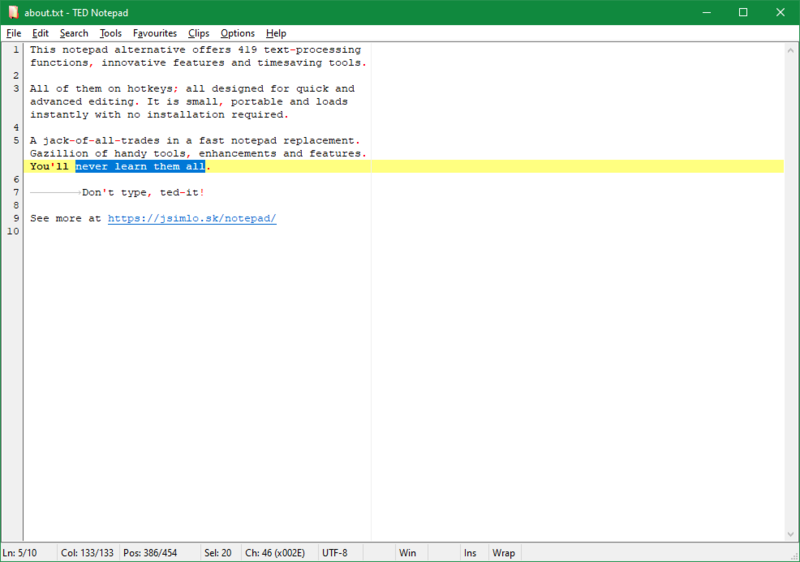 Commit actual Word Wrapping as you see it on the screen to permanently format your text for e-mails. Unwrap lines or paragraphs to undo wrapping from e-mails you've received. Include/Exclude text from/to files. Split your document into several files with no need to copy/paste anything! Merge several documents using quite the same way. Get a list of all words using the Extract Words tool. Try the Enclose selection tool or XML/HTML Tag tool for enclosing selected phrases quickly. Advanced Filters/Viewers architecture provides a very good place to use your own plug-ins, tools and applications to process your text. Do you need grep, sed, cut, dir, or something else? Take any console application (or make one for your self in C, Java, PHP or almost any other language), define its parameters as variables and then execute on a selection. TED Notepad will ask for variables defined to run the filter, pipe your selection in and gather the results. As simple as that! The maximum of hotkeys. Every single action has its hotkey. Quite favorite Exit by Esc is included as well. Extensive text statistics keep it clear. Calculate, how many words, sentences, paragraphs, lines or characters you type. UTF-8 support, with no need to BOM around. On top of that, all system Codepages are supported for multi-lingual users. UNIX and Mac newlines support for loading UNIX/Linux/Mac files. Actually, full transparent mixed newlines support is available, allowing to mix newlines in one file as necessary. Full support for binary files is available. This also includes support for huge files, e.g. 400 MiB AVI is not a problem. Favourites menu and Recent files menu to assist you to keep many important documents at hand all the time. Optional auto-save feature, which can create automatic timed backups, as well as watch for outside modifications. Having only one instance of each file opened is available. TED Notepad can store its settings to an INI file and can be run from any USB flash drive. It does not need any libraries or specific installations. Take the exe and ini with you anywhere. Supports bi-directional editing and all Unicode characters. Tested with Chinese, Korean, Russian, Bulgarian and Arabic. Plenty of view-scrolling hotkeys offer a very good place to move the view around. Advanced Go to dialog can jump relatively and/or select text along the way. Nice Select Word/Line/Paragraph features help to select and move the selection around. Delete/CutOff/BkSpace entire word or line help clear things up. Several nice command line parameters provide extra space for opening files at exact positions. Other parameters are designed to improve application start-up and settings loading. .LOG logging feature from original Windows Notepad, usually not supported by other notepad replacements at all. Automatically adds current date and time to the document. The application can Stay on Top of other windows or go Fullscreen or hide to the System Tray icon. Drag & Drop feature supports dropping multiple files. In such case, all the files are joined into one document. A lot of settings and options, including customizable Dual font support, Status Bar with actual cursor position and other document info, persistent window placement, tab stop values, open/save dialog filters, default file type, etc. The settings dialog is actually quite a feature itself! Design (c) 2008-2012, Juraj Simlovic. Site made with TED Notepad. Request took 0.0179 sec. Try out our Griddlers solver as well. Browse our Intel Pentium CPU Instruction Set Reference. Play online game dice wars 2 full screen. Play free angry birds free flash game online.